It is finally closing in towards Christmas. One of my favourite holidays 🙂 Which one is yours? In the run-up to Christmas, I tend to do more of those personal craft and DIY projects that somehow finds a way to fill up all that not-so-free spare time 😉 It tends to be lots of projects for my wee girls, even though there are some goodies in there for me too. So I thought I would share a bit of my personal craft, textile and knitting projects with you here on the blog over the up-coming weeks. 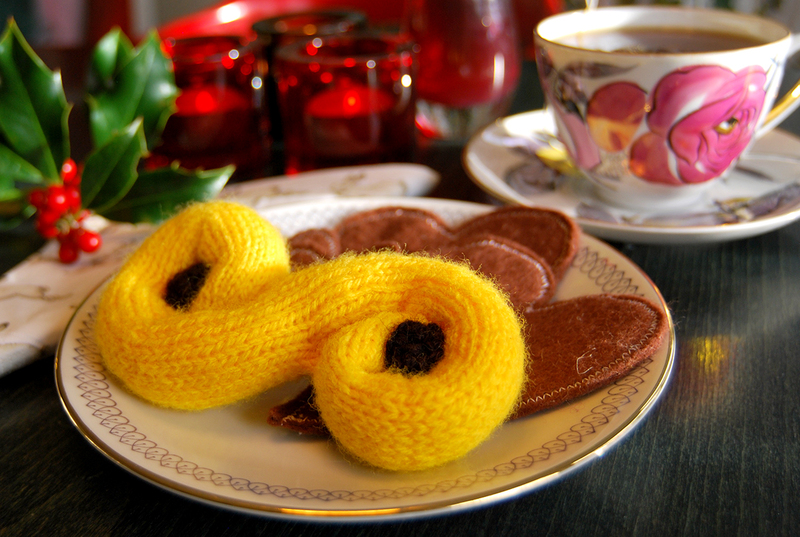 And since its getting close to Lucia (13th of Dec), a great and well-celebrated Swedish tradition, I thought why not start with how to knit my version of the ever-so-typical Swedish Lucia buns – the Lussebulle (saffron buns). They are yummy. I hope they will ‘taste’ yummy too. Jag använde restgarn av ull som jag hade hemma, så varför inte ta det du har hemma. Det funkar lika bra med ullgarn som akryl. Lägg upp 4 m på strumpstickor 3 med det gula garnet. Fördela m jämt över 4a stickor. Fyll den stickade ”tuben” med vadd. Packa inte vadden för hårt, då det kan göra det svårt att få till Lussebullens S-form. Fyll sista biten av tuben med vadd. Klipp av tråden, lämna längd för att använda för att sy ihop S-formen på Lussebullen. Trä tråden igenom de återstående 4 m, dra ihop sticket så att öppningen sluts. Rulla ihop Lussebullens S-form, och sy formen med hjälp av resterande tråd. Fäst trådar. Lägg upp 5 m på stickor 3 med det bruna eller svarta garnet. Klipp av tråden, lämna längd för att använda för att sy ihop samt sy på russinet på lussebullen. Trå tråden igenom maskorna kring russinets ytterkant, dra ihop sticket så att russinet får volym och sin russinform. Återupprepa mönstret så du får två stycken likadana russin. Sy fast russinen på Lussebullen. I used of what extra wool I had at home, so why not use whatever left-over wool you have available. It works well with for example wool or acrylic. Cast on 4 sts with the double-pointed knitting needles 3.00mm with the yellow wool, Distribute sts evenly over 4 needles. Fill the knitted “tube” with fibrefill. Don’t over fill it so that might make it difficult to create the S-shape of the saffron bun. Fill the last bit of the tube with fibrefill. Cut thread, leave length to use to sew the S-shape of the saffron bun. Thread through the remaining 4 sts, pull together sts to close the hole. Create the S-shape of the saffron bun, stitch its shape by using the remaining thread. Fasten threads. Cast on 5 sts on needles 3,00mm with the dark brown or black wool. Cut thread, leave enough length to use when sewing shape as well as sewing on the raisin. Thread through the loops around the edge of the raisin, pull together to create the shape of the raisin. Repeat pattern to make the second raisin. Sew raisins onto the saffron bun. More to come: Look out for next post of my ‘Personal Craft Projects’ where I will show how to sew another traditional Swedish Lucia treat – the Pepparkaka (gingerbread biscuit). You can have a sneak-peek at this week’s photo where they star together with the Lussebulle.